What happened to the dollar in July? The Australian dollar (AUD) has risen sharply against the US dollar (USD) during July 2017 (see chart 1). Indeed, the AUD is now nudging up to 80 US cents, for the first time since May 2015. This has occurred for a range of reasons including: better economic data in Australia and China; changes in global commodity prices; changes in global perceptions of risk and growth; market perceptions about the outlook for the US economy; market reactions to recent RBA commentary; and market reactions to commentary from various central banks globally. The Australian Trade Weighted Index (TWI) has remained relatively more contained however, at around 67 points, which is around the high points it reached in February and March 2017 (see chart 1). 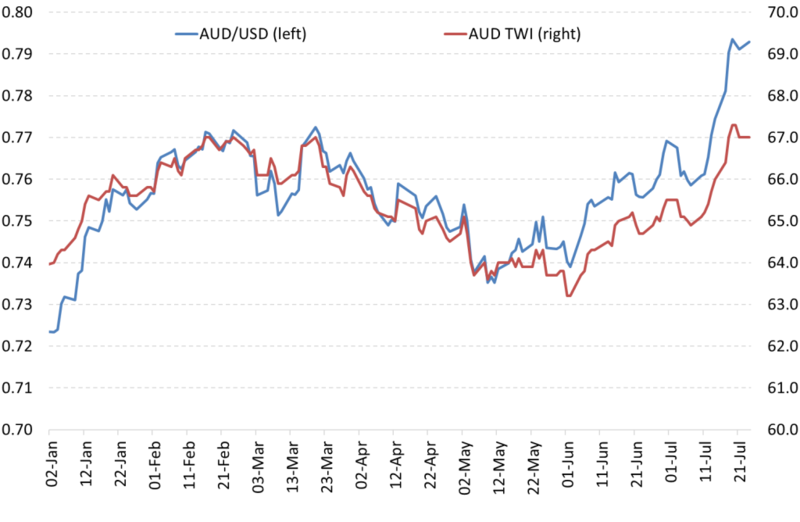 The TWI indicates the value of the AUD against a ‘weighted basket’ of the currencies most commonly used by AUD traders and by importers and exporters of goods and services. The more modest movement in the TWI (compared to the movement against the USD) reflects the fact that the AUD has not risen as sharply against other major currencies (e.g. the Yen, Euro and Pound) as it has against the USD. What is the best AUD trading range for Australian business? There is no single magic AUD value that is perfect for all Australian businesses, but at 80 US cents or less, close to 90% of Australian manufacturers say they can compete in export markets and 70% say they are competitive against imports. For every business that wants a lower dollar to assist their exports, another will want a higher dollar in order to pay less for their imported inputs, equipment for investment or capital funding. In many cases, exporters are also importers, and so the dollar is genuinely a double-edged sword. In Ai Group’s annual ‘Business Prospects’ survey for 2017 for example, many manufacturing CEOs reported that the lower Australian dollar had made their imported inputs more costly through 2015 and 2016. 84% of manufacturing CEOs said they used imported inputs in 2016, with an average of 32% of inputs (by value) imported for manufacturing purposes in 2016. In the same survey, manufacturers seemed to have revised down the exchange rates at which they expected to remain competitive in 2017, compared to previous years. In export markets, nearly all manufacturing CEOs expected to be competitive below US 70 cents and 89% expect to be competitive at or below US 80 cents. However, above this point, most manufacturers expect to be uncompetitive in export revenue, with only 38% expecting to be competitive in the US 81-90 cent range and only 10% in the over US 91 cent range. Previous CEO Surveys haven seen significantly more manufacturers expecting to remain competitive above the US 80 cent level (see table 1). Manufacturers competing with imports generally require a lower exchange rate to stay competitive, with 70% of manufacturers competitive up to US 80 cents, but significantly less remain competitive past this point. The proportion of manufacturers competitive past this point in 2017 was also significantly lower than in previous years of the same survey. Competition from imports and internet sellers increased as a concern for manufacturers in 2017, with 28% of manufacturers considering it their foremost impediment to growth (see Chart 2), up from 11% in 2016 and 9% in 2015. This reflects the development of online trade and the increasing ease with which businesses are able to source inputs from overseas. 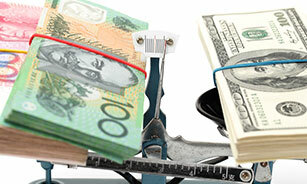 What do the latest currency movements mean for Australian exporters? Based on Australian business experiences with the AUD over the past decade, this latest trading range of 79 to 80 US cents should cause Australian exporters (and those competing directly with imports) to be alert, but not overly alarmed. At least not just yet. Our Ai Group Australian PMI® indicates that over the longer term, a TWI value of around 70 points or less is conducive to recovery and growth in manufactured goods exports (see chart 2). AUD trading values over 70 points tend to lead to declines in manufacturing export activity. This was the case for example, from 2011 to 2013, when the AUD was trading above parity against the USD and the TWI was well above 75 points. This elevated AUD over a very extended period contributed to a protracted downturn in Australian manufactured goods that in turn contributed to further falls in manufacturing output, investment and employment, following the falls already experienced from 2008 due to the fallout from the GFC. And it was during this period of above-parity AUD trading that Australia’s automotive assemblers announced they would pull out of assembly operations in Australia permanently from 2017. 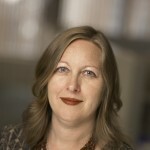 Many other businesses responded to the prolonged high dollar by: increasing their imported inputs; reducing other costs as they were able; closing or reducing their operations in Australia; and relocating some of their operations to other, cheaper countries. In the period since 2013, the TWI first dropped back to around 70 points and then from 2015, to around 65 points (see chart 3). This went a long way to helping to support a recovery in manufactured goods exports from 2015, which has in turn contributed to a recovery in manufacturing revenue, nominal profits and investment since 2016. 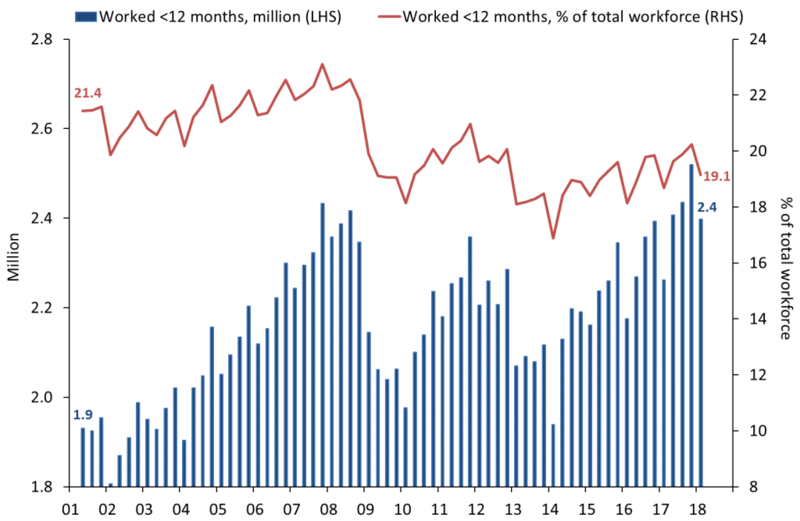 This recovery is only partial and needs to be kept in perspective however; around 40,000 jobs have returned since early 2016 for example, compared to almost 200,000 lost since 2008. At odds with other data sources, this recovery is difficult to detect in the ABS measure of value added output for manufacturing, which has continued to decline modestly, possibly due to the weight given to automotive manufacturing, which is now nearing its end in Australia. 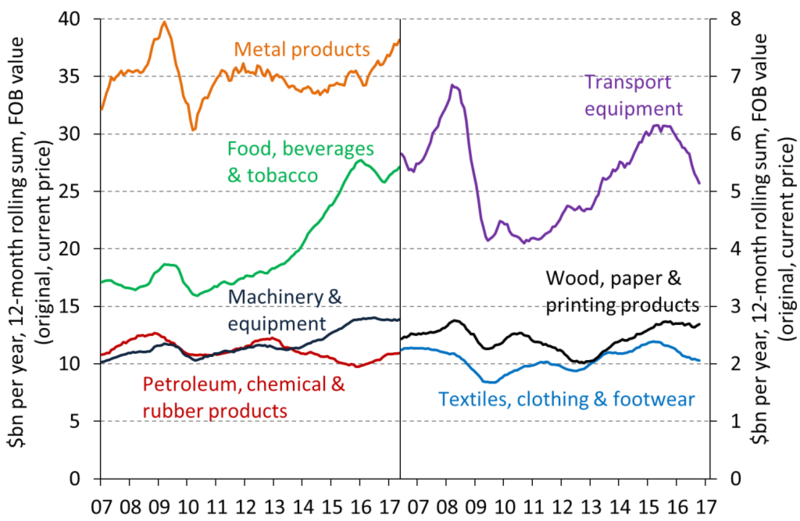 The recovery in manufactured goods exports since 2015 is evident across sectors including metal goods, food and beverages, chemical products (including pharmaceuticals, toiletries, cosmetics and related) and machinery and equipment other than transport equipment (see Chart 4). The automotive assembly exit from Australia has not been reversed and continues to detract from total activity in the manufacturing sector. Winning back local supply contracts from importers, in segments such as groceries, food products, building materials, furnishings and engineering construction equipment. Services exports can be harder to identify and track than manufactured goods exports, since much of it is in the form of spending within Australia by international tourists, students and other travellers. One way of tracking potential customers for our largest export services – tourism and education – is to look at short-term visitor arrivals (for less than 12 months). These data show that Australians have suffered from (or enjoyed?) 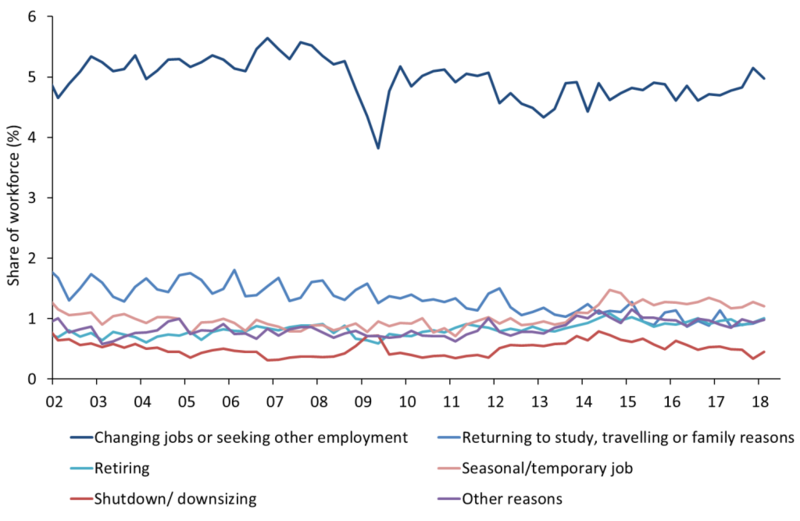 a ‘holiday deficit’ since 2008, with steadily more Australian residents departing for holidays than foreign residents arriving for holidays (see chart 5). Since early 2015 (roughly since the AUD fell below 65 TWI points), the number of tourist arrivals has shot up to around 4.2 mn per year (to March 2017), from 3.2mn two years earlier (to March 2015) and the ‘tourism deficit’ has narrowed, even though the number of Australian resident holiday departures has not fallen. These additional tourists add significantly to the holiday-related local spending, to the benefit of retailers, cafes, hotels, transport providers and others. It is also flowing through into stronger business investment spending and new construction to accommodate the arrivals. Even more dramatically, short-term international student arrivals jumped to 555,000 in the year to March 2017, up from around 410,000 two years earlier (year to March 2015). This indicates rapid expansion in the international education sector but also in the services supporting students during their time in Australia (e.g. housing, food, entertainment). As with tourism, this surge in demand is kindling interest in further investment in these sectors. Clearly, all of these growth segments in manufacturing and services exports rely on more than just the AUD for their competitive advantage. But even so, a higher AUD remains an ever-present risk to their recovery and outlook. At around 80 US cents and 67 TWI points, the AUD looks elevated but not excessive in July. The AUD is a key risk to be watched by exporters, but probably not an immediate source of danger, at this point in the cycle. Data sources: ABS; Ai Group Business Prospects 2017; Ai Group Australian PMI®; Ai Group, Business responses to the Australian dollar; RBA. For further commentary on the AUD in July 2017 see Julie Toth’s interview broadcast on ABC TV’s The Business on 24 July, 2017.